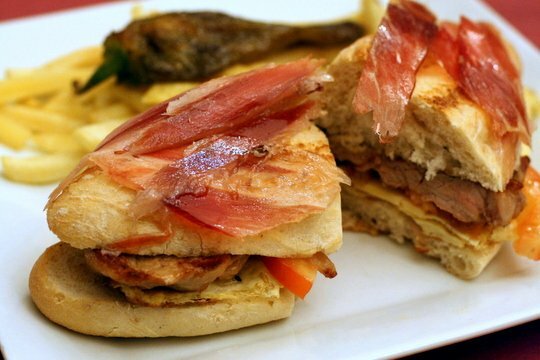 If you’ve spent any time at all in Spain, you know that here the bocadillo reigns supreme. This simple sandwich is the staple of lunch, merienda and many an improvised dinner… not to mention midnight snack time. While it can be stuffed with all manner of fillings, one of the best and most typical varieties is the Serranito. Read on to find out more about this quintessential Spanish sandwich, then make your own with the help of my Serranito bocadillo recipe! Put simply, it’s a sandwich. But before you go out in search of bread and ingredients to make your own, there are some basic facts you need to get straight. In Spain, bocadillo refers to a sandwich made on a long, tubular barra de pan (the Spanish equivalent of a baguette). It might be stuffed with cured ham, pork, tomato, tuna, cheese, fried squid or any other combination—but simplicity is key. Bocadillo de calamares: Spain’s famous fried squid sandwich. A sandwich, on the other hand, is made on pan de molde (square, sliced bread). The most common variety is a sandwich mixto: toasted white bread with melted cheese and sliced ham (the cooked kind, not cured). This can be confusing, as English speakers tend to refer to anything between two pieces of bread as a sandwich. But in Spain it’s an important distinction. Try bocadillos and more on our Spain food tours! What makes it a Serranito? Now that we’ve got our sandwich types straight, let’s get down to the details. 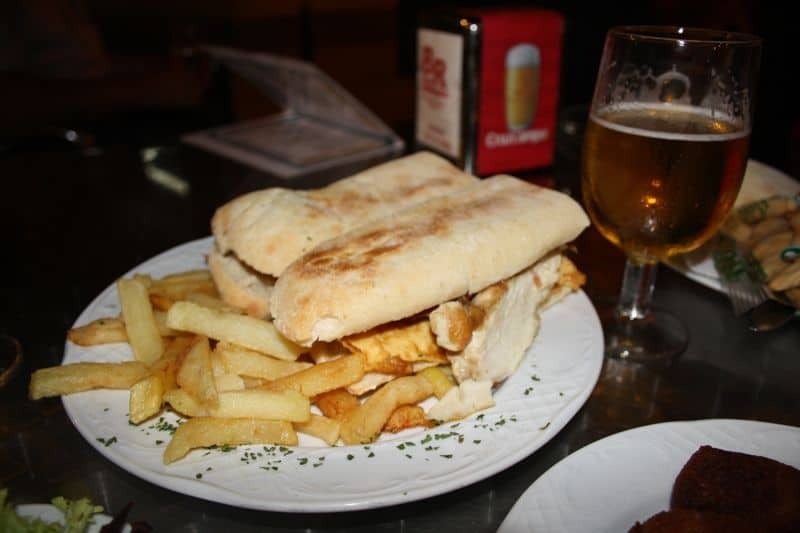 A Serranito is a specific type of bocadillo invented in the southern region of Andalusia. In the 1970s, José Luis Cabeza Hernández—aka José Luis del Serranito—patented a variety of bocadillo that had gained popularity as a tapa in Seville. He made it into a brand, in fact, and opened two restaurants under the Serranito name in the 1980s. The formula was—and is—simple: bread, pork loin, cured Serrano ham, tomato, and a sautéed green pepper. This is double the number of ingredients that usually comprise a bocadillo (ham and tomato, ham and cheese, bacon and cheese, etc.). Perhaps the double meat and veggie action is what makes this variety so beloved. It’s a combination of some of Spain’s most iconic ingredients, all in one simple, cheap, and hearty dish. Serranito bocadillos are usually served with fries. The bread of a Serranito is either a viena andaluza (a short, oblong bread roll) or a mollete (a round, soft roll typical of Andalusia). The pork loin is sliced thin and cooked until golden brown. The cured ham is jamón serrano, a close cousin of jamón ibérico (the difference is in the breed of pig). The tomatoes are sliced and the pepper is drenched in olive oil and cooked until tender. Finally, the whole thing is served with mojo picón (a spicy red sauce) or garlic alioli (like garlicky mayonnaise). Unless you’re in Andalusia, it can be tough to find this treat on the menu at bars and restaurants. But before you go buying a plane ticket, follow these simple steps to assemble your own Serranito at home! With this easy recipe, you can enjoy this hearty sandwich whenever and wherever you want. Heat the olive oil over medium heat in a small saucepan. Cut a slit in the peppers and fry them in the oil until tender and crispy. Set the peppers on a paper towel and sprinkle them with salt. Set aside. Fry the pork loin in the oil until it's cooked through and golden brown. Slice the baguette/roll in half and toast lightly. Drizzle each side with a bit of olive oil. Place the peppers, pork loin, ham and tomatoes between the bread to assemble the bocadillo. Serve with mojo picón or garlic alioli on the side. For a lighter tomato flavor, rub two halves of a tomato on the bread instead of adding slices. Some people also add a fried egg, omelet style. And if you're really hungry, the traditional side dish is fried potatoes! Have you tried this Spanish specialty yet? Got any tips or variations on this Serranito bocadillo recipe? Share them in the comments! 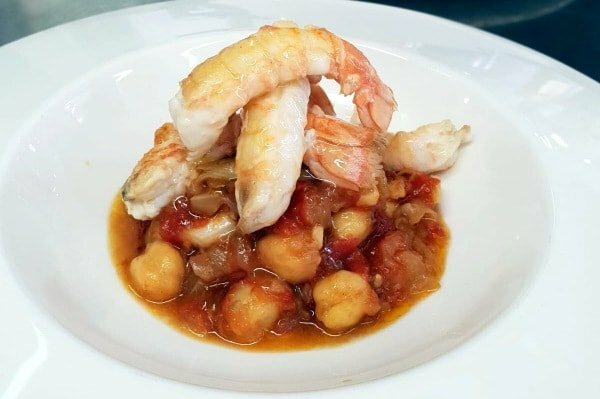 Pingback: Seville on a Plate: 5 Best Bites Worth the Trip - An Insider's Spain Travel Blog & Spain Food Blog! One of my all-time favorites! No road trip is a true Spanish roadtrip without a Serranito in tin foil. Hola! Me gustó mucho su receta e historia sobre los Serranitos Bocadillos y la influencia que tuvieron en España. Aunque me gustaron todos los detalles que hizo para beneficiarnos, me gustaría posiblemente ver un vídeo enseñándonos como preparar este platillo. Aparte de eso, pienso que no hubo nada mas en lo cual podría mejorar, porque todo estuvo muy bien. Espero poder hacer muchos de sus menús en el futuro y poder disfrutarlos, y compartirlos con mi familia y amigos. Gracias por compartir este platillo delicioso, me lo comeré en unas horas. great recipe – we’ll try this weekend ! Actually, calling anything between between two pieces of bread a sandwich is an American thing, not an English-speaking thing. Growing up in Australia, we only used the term sandwich for things make with uniformly sliced bread (usually from a supermarket packet). We would never have called a hamburger (in a bun or bap) a sandwich. Nor would have called a filled baguette (or “sub”) and sandwich, had we had such things. The American usage is now creeping in, but I suspect that throughout the Commonwealth the usage was closer to that in Spain than the American one. I agree with you David. I’m an Aussie too and a sandwich is flat, square and made with thin slices of bread (Pan De Molde). My American brother in law used to refer to anything really flat as being “as flat (or thin) as an Aussie sandwich” in reference to the meagre amount of filling we use in comparison to an American sandwich. And it took me ages to get used to referring to our products as hamburger “sandwiches” when I worked for Burger King. I think we’d have called a spanish bocadillo a “roll” if we’d seen them when I was a kid. El Serranito: The Best Sandwich Ever!